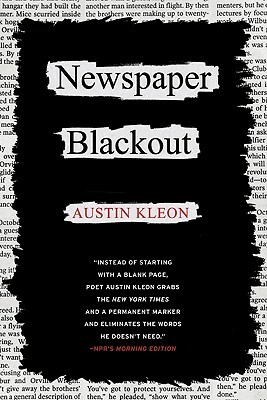 Newspaper article + sharpie = Newspaper Blackout Poetry: Instead of starting with a blank page, poet Austin Kleon grabs a newspaper and a permanent marker and eliminates the words he doesn’t need. Fans of Not Quite What I Was Planning and Post Secret will love these unique and compelling poems culled from Austin’s popular website. Instead of starting with a blank page, poet Austin Kleon grabs the New York Times and a permanent marker and eliminates the words he doesn’t need. One can imagine taking up blackout poetry on their daily bus commute in place of sudoku or the crossword puzzle. Sort of like Michelangelo carving away the marble that imprisoned what he saw within.